Objective: In lung resection, thoracoscopy has been mainly used for wedge resection and lobectomy. Several reports have discussed thoracoscopic segmentectomy. However, most of these reports are limited to describing the procedure for segments that can be excised easily, such as the lingual segment. 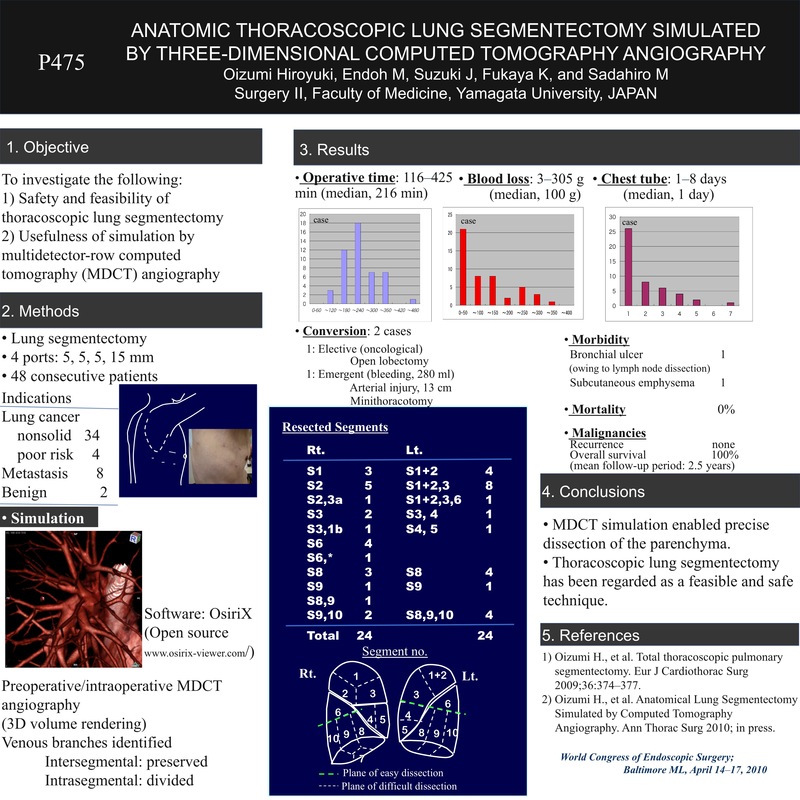 We report the safety and efficacy of thoracoscopic pulmonary segmentectomy and the usefulness of simulation by multidetector row computed tomographic (MDCT) angiography. Methods: From September 2004 to April 2009, 48 consecutive patients underwent thoracoscopic lung segmentectomy without mini-thoracotomy. Preoperative diagnosis included 34 cases of nonsolid lung tumor in whom the tumor was considered to be non-invasive lung cancer, 4 cases of lung cancer with poor risk, 8 metastatic lung tumors, and 2 benign lesions. The median age of patients was 68 years (range, 16- 85 years). Four 5- to 20-mm flexible ports were used. The pulmonary vessels were ligated, and the bronchi were closed with staplers. The vessels were identified preoperatively or intraoperatively using the three-dimensional volume-rendering method of contrast-enhanced MDCT. The simulation images were used to identify (1) the venous branches in the affected segment that was to be divided and (2) the intersegmental veins that were to be preserved; these data were used in the surgical procedure. The parenchyma was dissected along the intersegmental vein by using an electrocautery, and staplers were used for dissection in the peripheral lung tissues. By assessing the intersegmental veins, we thoracoscopically removed even those small segments for which segmentectomy has not been reported. Visualization of an intersegmental plane by creating an inflation-deflation line also enabled to dissect the anatomical plane. Results: 46 patients underwent complete thoracoscopic procedure. Mini-thoracotomy was performed in 1 patient because of arterial bleeding, and open lobectomy was performed in the other patient because of oncological reason. Operating times ranged from 116 to 425 min (median; 216 min) and bleeding ranged from 3 to 305g (median; 100g). Chest tubes were left in place 1-8 days (median; 1day). Local recurrence or metastases have not been observed in malignant cases. Conclusion: Our image-based computer assistance allowed understanding of patient’s individual anatomy and made it possible to dissect the parenchyma precisely. Thoracoscopic lung segmentectomy has become a feasible and safe technique by the simulation of MDCT angiography utility.